FACE MELTING BLOG: "Deads": For LIFE! So today I'll start with the punchline: Deadlifts are the single most body-strengthening and body-quickening movement out there, bar none. So why are new lifters always so afraid of them? Is it the potential for injury? 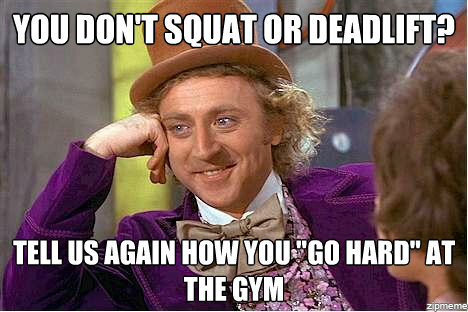 Is it because deadlifts are really challenging? Do new lifters suffer from simple fear of the unknown? Or could it be a combination of all three, made worse by the misinformation spread through gyms and chat rooms the world over? To strengthen the posterior kinetic chain- from the calves to the traps, and everything in between. To stimulate the nervous system- all that branches from the spine. To prompt a global hormonal response to training- making you bigger/faster/stronger overall. Sound good? Let's jump into my work out, and then discuss these 3 life-giving points of "deads". I shouldn't have to qualify the statement that deadlifts will strengthen the posterior kinetic chain: it's obvious that as you train specific areas of the body, they will become strengthened. What NOT as obvious to a new lifter is just how many muscles comprise the posterior kinetic chain- all used during a deadlift- the calves, hamstrings, glutes, quads, erector spinae, traps, delts, abs, etc. There's a reason the old dogs at the gym do deadlifts on the regular: they get a lot of work done in a short amount of time. With all those muscles at work, your 'proprioception' should increase, right? Of course. BUT, when you challenge yourself with heavy deadlifts, as part of a balance exercise program also including plyometrics and agility training, you also drastically increase the effects. Lastly, what do I mean by "global hormonal response to training"? I mean that as you activate the entire posterior kinetic chain in one movement like the deadlift, it sends a clear signal to the pituitary gland to release growth hormone, which is key to making gains. Other hormone signals are sent during heavy/intense deadlifting sessions- all gravy, in my opinion. Nothing jacks up growth hormone more than deads. I love deads. They are the epitome of life: growth, sensation, and strength! What's your favorite type of deadlift?